Many of you have heard this story, but it bears repeating. When we adopted Maxwell five years ago, we didn't know that he was profoundly deaf. 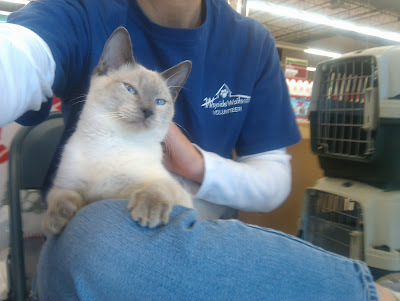 Our first photo of Maxwell, sitting on my lap during the adoption process. We also quickly discovered he was one sick kitty. The very evening we adopted him, we ended up at the emergency vet. Diagnosis: Kennel Cough. Wow, really? At the time, I thought that was a disease associated with dogs. Kennel Cough is the common name for respiratory infections often found in shelter animals, specifically in the windpipe and lungs ("tracheobronchitis"). And - though rare - it can infect cats as well as dogs. Kennel Cough got its nickname because it's commonly found in companion animals being kenneled in a shelter. Being kenneled is stressful on any animal, more so with cats than dogs. And numerous studies have found that stress plays a key role in immune suppression. Animals with suppressed immunity are more susceptible to diseases like Kennel Cough. They're also susceptible to another, equally painful condition, an opportunistic disease also found in immune-suppressed animals. And the emergency vet failed to find it, despite a question we asked that I believe should have led to its discovery. The emergency vet snapped her fingers behind Maxie's head, clapped a few times, then looked up and told us, "Looks like he might be, but it's hard to tell." And then she sent us home. That night, I noticed an awful smell emanating from this new kitty cuddled up next to me in bed. The next morning, Maxie got a bath, much to his chagrin. Yet still, he smelled. "Momma, let's talk about me and bath time. I think you might be a teensy bit obsessed with that. My FUR didn't smell. My EARS did." Maxie's regular vet diagnosed it early Monday morning after I took him in "to be groomed" (because obviously the bath I gave him was inadequate). Our vet leaned down, took one sniff and told me he didn't need a bath. He needed medication. Maxwell had a raging ear infection. Ear infections are opportunistic fellows. They are very painful and can lead to deafness. They're tenacious, too. It took five months - five months - of daily treatment before Maxie finally was declared infection-free. That day, he was given a thorough ear wash, then sent home with antibiotics and antifungal treatments, both oral and in ear drop form. What about in the shelter where you volunteer? Shelter medical staff often rely on the observations of volunteers to help them catch disease early on. I've made it a habit to check each shelter cat I visit for dirty ears. I also lean in and check for any foul odor. I'd encourage you to, as well. If there's debris or an odor, let shelter staff know. And in your own cats, if you see wax, dirt, or other debris, then it's probably time for a cleaning. No, Faraday. Not THAT type of cleaning. You should NEVER stick a Q-Tip in ANY pet's ear! I like what I see in the ingredients label on the Bayer® ExpertCare™ Ear Care Rinse and if I could, I would use it on Maxwell. But Maxie's case is special - he has a birth defect. He was born without an eardrum. So any ear drops I gave him would bypass the outer ear and go straight into his middle ear. So instead of a product review, this is me advocating for both a heightened awareness of the signs of ear infection in cats, as well as the responsible use of safe ear rinse products. And Bayer® ExpertCare™ Ear Care Rinse is one of them. Please don't try a home remedy without thoroughly researching it first! The Merck Veterinary Manual cautions against using home remedies and vinegar dilutions, stating they cause swelling of the ear canal lining, which will predispose your cat to opportunistic infections. 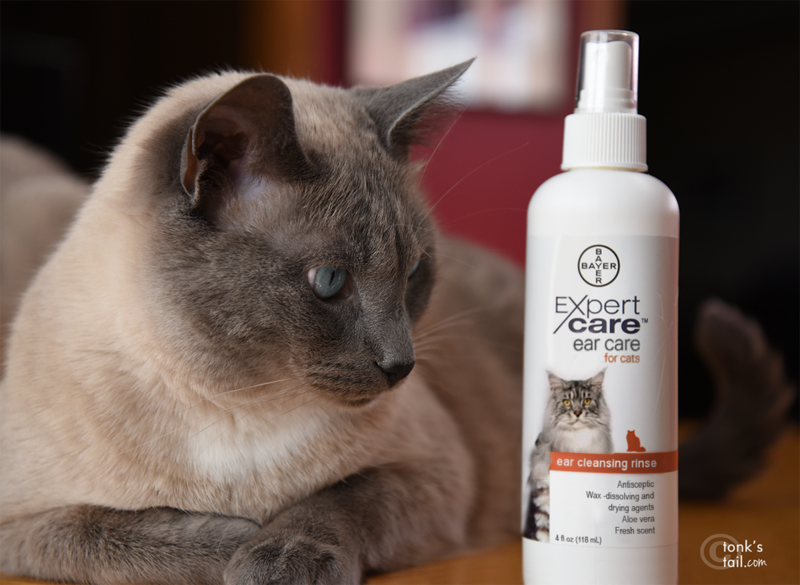 A product like Bayer ExpertCare Ear Cleansing Rinse is safe for use on cats. Some home remedies are NOT. Bayer's Ear Cleansing Rinse contains Salicyclic Acid, which reduces swelling & redness. It contains Benzoic Acid, which is an antifungal agent. And it contains Dioctyl Sodium Sulfosuccinate Surfactant, which is a cleansing and emulsifying agent. And it can be purchased at your local PetSmart or on PetSmart.com. I think because of all of the strays I've taken in I'm always looking in ears because I've seen too many mites in my day. I check the Farm cats ears all the time. Thank you so much for this info. My Dusty occasionally has a brown wax like build up in his ears. I use a warm moist cotton ball to gently wipe the ear, but nothing more. His ears haven't smelled at all, but I'm going to speak with my vet at his check up about it and this product. My human is a little lazy about checking my ears - yes, I was born and raised indoors, but you never know what I may pick up! So she needs to get on it more. BTW, the vet said Binga had "Kennel cough" when my human picked her up from the ACC she was rescued from, but I think he meant the traditional URI that many cats and kittens get at these facilities, not the kennel cough you mention here. Still, she is the first cat to get the sneezes around here if there's a bug floating around. I do check our cats ears regularly. However, because Rosie suffered frostbite on her ears in her former life, it is difficult to really see very far in her ears. This sounds like a great product and we will certainly give it a try. that would be something good to add to our shelf of cat stuff. How interesting...and poor Maxie!!! I've never had a cat with an ear infection so consequently have never checked their ears. Although my kitties get so many kisses that I'm sure I would notice a foul odor there! Fernant had kenel cough as a puppy and his breeder brought him to the vet to be PTS!!!! Thankfully, the vet spirited him away and he was eventually adopted by our neighbours. Our # does check our ears fairly regularly. I didn't think about cats getting kennel cough. I feel your pain with ear infections. I have fought them for years with Bentley. That photo of Faraday with the Q-tip is priceless! Thanks for this I am going to share it far and wide. 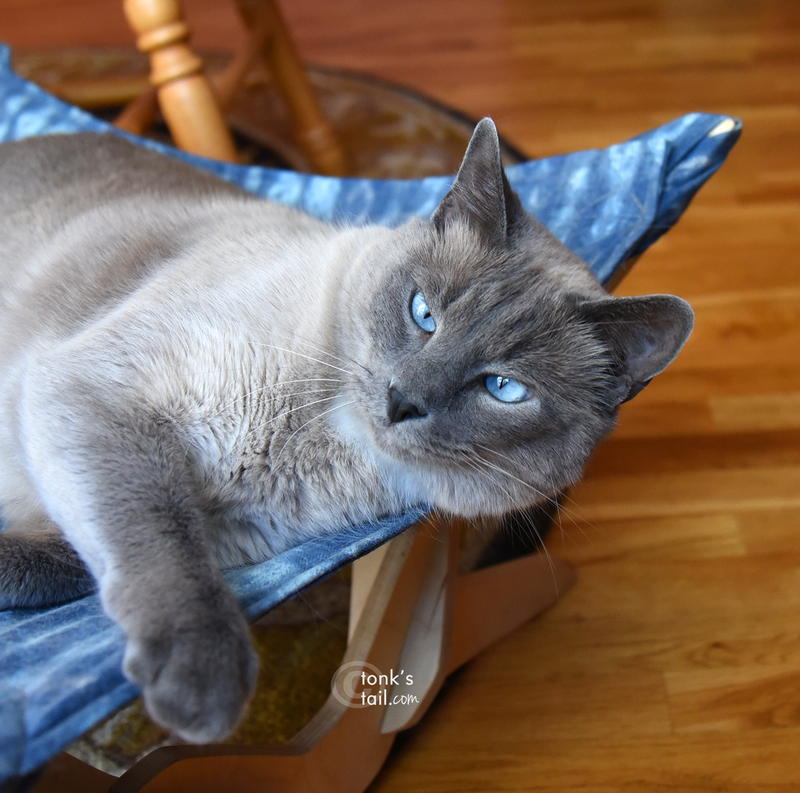 As soon as I knew the theme, several kitties with ear issues came to mind, including our sweet pal Bootsie (thank you for helping - it helped mae a BIG difference). I keep a running check on ours as they active outdoor types. 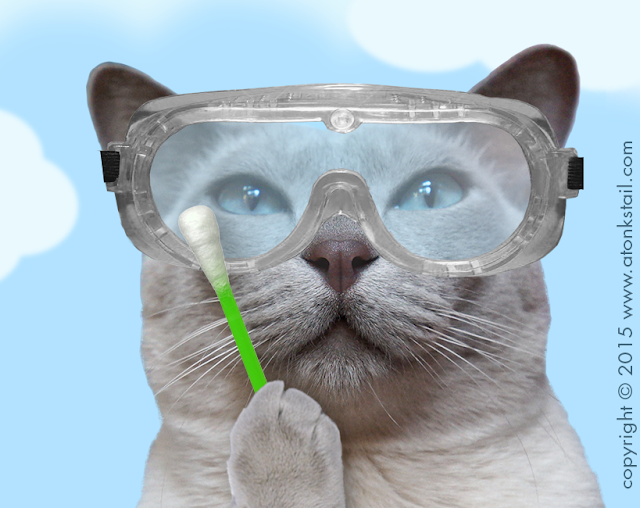 I clean all my cats' ears that get wax, but I guess i have been wrong in using q-tips. Thank you for the kind words you left for me on the passing of Stinky. My mum checks my ears regularly. A year or so before Eric died, he suddenly went deaf. His ears didn't look dirty and there was no smell. When the vet examined him he could see some dirt deep down so our mum had to clean his ears twice a day. After about a week a large piece of solid wax came out and a few smaller pieces emerged over the next few days. Thankfully Eric's hearing returned. I am obnoxious about ears and about eye boogers.. and I must also comment that I am so totally over people recommending vinegar for cats in any way shape or form.. what cat likes vinegar??!? it only stresses them out. I'm also completely unimpressed with the vet for not noticing Maxie's ear issue.. thumps to them. Thanks! I didn't know that Bayer had an OTC product, but will keep an eye out for it. I DO know that cats can get kennel cough, Ralphie had it when I adopted him, along with kitty herpes, he was a mess! I also know about the chronic ear infections! I fought Maize's for almost 6 months before we got the right mix of medications and dietary changes to clear it up. She has been infection free for 5 months now and it has been HEAVEN! When I adopted Ernie he had a really bad case of ear mites. It took a while to eradicate them. Thanks for sharing Maxie's story with us...and some important info about ear infections. Wow...we did learn something new today. Thanks for this informative post. A while back, Minko had very red crusty ears...on the outside, apparently he was also allergic to something he was eating...no longer eats that, had a course of some topical steroids and now his ears are normal. No crusts either. Great post! My Angel Rose suffered from a serious ear infection as a senior, she lost her balance and was immobile for many weeks. Interestingly this happened 2 days after her annual vaccination - I still swear to this day, there was a link between the two, although the vet denied the possibility. Thanks for the info. Most informative. Kali tends to get dirty ears. She barely goes outside at all but she has allergies and the vet says the dirty ears are part of the allergies. This is baffling to me but I appreciated your info on how to clean the ears. That precious Maxie, bless him. Thank you for your loving expert care of him. Good for you for catching his ear infection. Thanks for stopping by our heart day celebration! That is one terrific post. I do watch my cats and if they are scratching their ears or shaking their heads, I sure take a good look at their ears. I do have one cat that is deaf but he came here that way. Have a great day. Thanks for visiting Critter Alley! Sure hope everything is fine now. Bogey has never had an ear infection. Winston's ears get gunky at the drop of a hat!